4.1 What is the allowance decision? Implementing Work Life Balance policies is essential in order to move an organization towards a rising level of acceptance and allowance among both-workforce and man-agement. The implementation is a slow and steady process. It requires commitment, motivation and staying power. 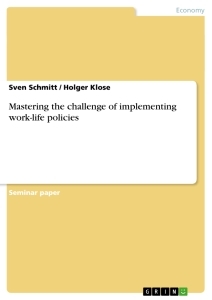 While developing a work-life program, the major decisions which have to be made are those dealing with implementation and the individual allowance. As an approach to accomplish this challenging change process, the Family Responsible Company Development Model provides a structured foundation by differing 4 stages a company has to face until reaching its final objective of being an ideal work-life-balanced enterprise. The four major decisions a manager faces while planning to introduce WLB- Programs in a company are the following: Adoption, Design, Organizational Implementation, Individual Allowance Decision. Since there is no single path of development, the company has to take internal and external factor into consideration, that influence its decision making. Internal factors, for instance are size and organizational complexity, which influence the effort of implementation. Also previous strategic choices direct future decision. On the other hand the company cannot manage measures like the status of the labor marked or the economy, which still shall be taken into account. The overall purpose of the model can be described as a step by step road map leading to a balanced existence of achieving proper economical results, while respecting decisions of personal life choices. The model is classified as an instrument of change, which is depending on additional evaluation & diagnostic tools in order to generate its full potential. Policies in general reflect formally designed rules that apply within the company. In order to be followed, those need to be communicated to and understood by all affected employees. Policies main purpose is to create a link between work and personal responsibility. This measure describes the actual use of WLB- Policies OR equally important habits and practices which are not explicitly implemented. Those habits have developed coincidently (unmanaged) over a period of time, formed by the way work is organized and by the traditionally played roles of employees. Non-policy-driven practices are not unfavorable in any case. Depending on their direction they can contribute to the organizational culture in a supportive way, encouraging employees to build up an enriching equilibrium between works on the one hand and family (life) on the other. Unfortunately there are also deconstructive practices, causing an undesirable burden which needs to be overcome. Belonging to this topic, e.g. is the questionable believe in the relation of working overtime and crating an inevitable surplus in output, followed by the expectation of increased chances in job promotion. If managers, as role models, act in that manner, staff feels obliged to act alike. Depending on the culture, positive changes can be realized quicker in a supportive environment. For this reason an assessment of culture is helpful in the first step before planning any improvements. Since culture is an hard to measure status, it is suggested to evaluate instead the amount of support present in the organization by the dimension of managerial support for WL-Harmony, career consequences (while using WLB offers) and organizational time expectations (interference with family responsibility). It should be noted that of course the presence of a supportive culture is a better indicator of WLB support then just the availability of the programs. Enablers set up a strong foundation for a framework of supportive policies. They help to promote positive practices, translate values into norms, encourage WL-Harmony and supportive prosper organizational culture. Referring to a set of factors, with the purpose of "driving" each phase of development and support the advancement to the next level, their consideration is essential. Research in companies of different sizes has shown that a breakdown in any of those drivers will interrupt and harm the development process at any stage. Resulting in frustration, disappointment, unsatisfying results it might even reduce or withdraw dedicated resources, drifting to the abandonment of implementation efforts. The aspired goal is the harmonization of personal and work life, being experienced by the work force as an integrative part of business. Relating to this emphasis, responsibilities are not only assigned to people, but in addi- tion the resources time and money are assigned to short, medium and long term pur- poses.